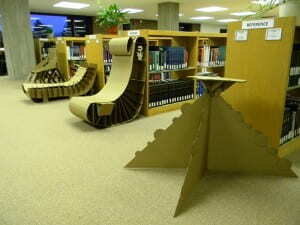 On display in Cofrin Library, 3rd floor: Come see cardboard chairs constructed by students in Prof. Mindy Wittock’s Art 106 Design Methods class. Each chair was designed by a group of students with the criteria that it may only be made of 10 or less sheets of cardboard, they could only use craft/fabric glue for adhesive, and it must support a human being. Students also spent time researching in the library and attended information literacy sessions with the librarians. Visit our Flickr set for a closer look.